When you've been in this game long enough you'll see exactly the type of flow where salmon are consistently hooked and hold up in. 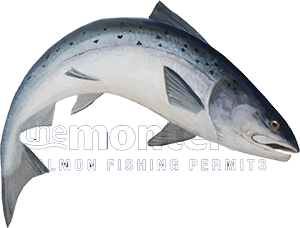 Being able to pin point these likely holding positions will always provided you with a 'massive' salmon fishing advantage and this skill set will give you the power and water coverage of ten salmon anglers if mastered properly. Knowing when to fish quickly through the less likely areas of a pool and slow up to the 'correct' fly swing spacings will increase your 'effective' water coverage significantly. Salmon don't often sit in fast water unless there's a riverbed pocket of slack water where they can get a break from the current. Often you'll never know salmon are lying up in fast water unless one is foolish enough to show! The one big exception to that rule is when the river is running warm in the heat of Summer when water oxygen levels are low and that's when you'll find the resident fish sitting up high in the neck of a fast flowing pool but again only as long as it's not physically taxing them too much. Like any other creature on the planet salmon will take rest whenever they can to counter act the exertions of upstream migration. In the vast majority of cases you'll locate resting salmon in the smooth slower moving glides where they can hold up with a steady flow of water entering their mouths and processed out through their gills. If there's some added depth for security then that adds another tick to the salmon's selection choice. Boiling turbulent water where the flow is coming from all angles is not attractive to salmon but 10 yards back where that turbulence smooths out again with the added break in the flow from whatever was causing the turbulence to begin with could easily be a great salmon lie so pay particular attention to the water immediate downstream when there are any signs of the presence of a sub surface feature. Scan for the calmer inside edge of a stream for a resting fish or that smooth deep glide near the tail or mid section of a pool. Look for the water that provides some respite for a fish to hold in without it getting knocked about by the power of the stream. When the old osprey appears look at the areas of the pool where he's hovering directly over or look for odd looking stones on the riverbank that have been placed there by other anglers to mark the position of a salmon that's been continually showing. All salmon pools are easy to work out once your eye has the ability to identify its likely salmon holding areas. Don't underestimate the value of thoroughly surveying the likely salmon beat holding areas and moving quicker through the less likely areas.